RRB Ranchi Group D Recruitment 2018-2019 is available now. So, those who are eagerly waiting to check the Eligibility Criteria can check from this post. We have given all the details in a single page. Moreover, we all know that checking the Official Notification is a time taking process and also search burden. To avoid those complications we have equipped all the data in a single place. By checking this post all the job hunters can get the sufficient information about 2525 Vacancies. Therefore, soon after completion of verifying the current article, you will get the clear idea about Education Qualification, Age Details, Selection Process, Application Fee Details, Salary information, Online Application Process details, Steps to apply for RRB Ranchi Group D Recruitment 2018-2019 etc. Also, visit the official site and check rrbranchi.gov.in Vacancies. Many of the people had started their application process from 10th February 2018 onwards. Meanwhile, the last date to apply for RRB Ranchi Group D Job Openings 2018-2019 is 31st March 2018. Actually, many of the people are thinking about the closing date. So, we intimate the aspirants that the authority extended the Final Date. This is a very good news for the people. 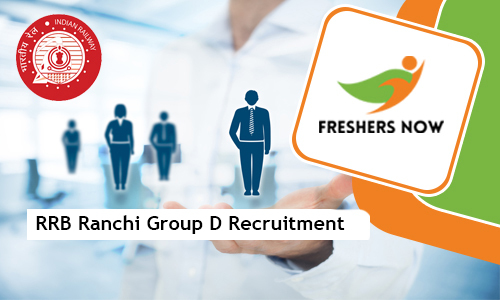 Moreover, the main reason to extend the closing date is many of the people are showing their interest in applying the RRB Ranchi Group D Recruitment 2018-2019. Therefore, competitors can follow the below-given procedure and apply for 2525 Vacancies as early as possible before the deadline. And we are informing the people to follow the below sections to get furthermore information. So, please verify the mandatory data from this post and follow to apply for RRB Ranchi Group D Recruitment 2018-2019. We have given a complete information regarding RRB Ranchi Group D Recruitment 2018-2019 in the above table. So, all the candidates those who are in search to get the entire info can happily refer this article. By referring the RRB Ranchi Group D Notification 2018-2019, you can get Application Fee information. Moreover, we all know that there is a different pay for each category. So, the General category candidates need to pay Rs. 500/- as an Application fee. And other candidates should pay Rs. 250/- and there is no examination fee. So relax now and pay only Application Fee by following some of the steps. Moreover, to get payment info just click on the below given official Notification which we have collected from the official web portal rrbranchi.gov.in and shared in this article at free of cost. So, before proceeding you have to check the Official Notification twice. And also, eligible people only apply through Online Mode. Now it is the correct time to check for Education Qualification details. So, 10th class or ITI or its equivalent from NCVT or SCVT in India is the education requirement that the officials of Railway Recruitment Board Ranchi asked the candidates. And also, many of the people had done their 10th class and waiting for any Jharkhand Government Jobs. For those people, the current Railway Jobs are very helpful. We all know that 10th class is a less education. But the Railway Board is inviting the 10th Standard or ITI candidates are eligible to apply for RRB Ranchi Group D Recruitment 2018-2019. Definitely, this is the turning point for all the job seekers in the state of Jharkhand. Also, most of the people are finding the misleading information from various sources. For those candidates, our suggestion is we have provided all the genuine information from this post. Without late, just focus on the complete details and process. At the time of applying the RRB Ranchi Group D Recruitment 2018-2019, you should check the Age Details. So, the organization of RRB, Ranchi stated that they will accept the candidates that age is in between 18 Years to 31 Years. Meanwhile, this is the exact age for all the candidates those who want to apply for 2525 Vacancies. And also, Written Test (Computer Based Test), Physical Efficiency Test (PET), Document Verification and Personal interview are the rounds that all the applicants should face. So, those who will clear all the selection rounds are only eligible to work with Railway Recruitment Board. And also, you will receive Rs. 1800/- per month. So, this is an excellent pay for the organization. Therefore, by referring the below sections, you will get much more details. SC/ ST/ Ex-Serviceman/ PWD/ Female etc: pay Rs. 250/-. Check the below age which is officially given by the authority of RRB Ranchi on their official RRB Ranchi Group D Recruitment 2018-2019 Notification. Moreover, Age Relaxation is applicable. All the selected people can get the above salary. 10th class or ITI or its equivalent from NCVT or SCVT in India. You can freely download the RRB Ranchi Group D Recruitment 2018-2019 Notification from above link. Also visit rrbranchi.gov.in regularly. Freshersnow is the perfect place to get all genuine information.